Backpacking Vietnam: Travel Tips For My Favourite Country in SE Asia! 3 Items – Don’t Forget to Pack! 3 Items – Buy While You’re There! 3 Destinations to Go Next! Soaring mountains, tranquil beaches, weird and wonderful delicacies, vibrant history, wild parties, unlimited outdoor adventures, the cheapest beer EVER… I couldn’t get enough of the place. It’s a fast-blossoming flower on the backpacker scene but is still beautifully untouched in places (for now) – so get over there as soon as you can! Here follows my guide to getting the most out of a trip. The streets of Hanoi, Vietnam. Hanoi and Ho Chi Minh City are hotspots for history nerds like me, but there are points of interest all over the country. From seeing Ho Chi Minh’s preservative-pumped body in the Mausoleum to crawling through complex tunnel systems built by the Viet Cong, you’ll never be at a loose end. Yep, you heard me right. The appealingly named Pub With Cold Beer in Phong Nha offers the ultimate farm-to-table experience: you pick out a chicken, kill it yourself and have an hour or two to float down the nearby stream in a rubber tube while the owners prepare and cook it for you. The result: a plate of rice, morning glory, homemade peanut sauce and the freshest, most ethical and satisfying meat you can get. This potential setting for a horror movie/secret rave has stood untouched on a peaceful lake in Hue for at least a decade. Once upon a time, it must have been an awesome park, but now the slides are dry, the water is dark and murky and the only sounds are crickets chirping and broken glass crunching underfoot. It’s a perfect day out for lovers of all things whacky and slightly spooky. There’s no better way to explore the vast, colourful landscapes than on two wheels. It’s easier than it looks! This combination of abseiling, cliff-jumping and jungle trekking is not for the faint of heart and is best done with adventure companies in Dalat. Ever been to a theme park and felt that jolt of terror in the split-second you think that your seatbelt is broken? Sand dune buggying in Mui Ne, Vietnam is like having that feeling for fifteen minutes straight – and this time, you don’t have a seatbelt, to begin with. If zooming over vertical planes of sand at a speed so fast you don’t even have time to scream is your thing, buckle up (or not, as it were): this is your calling. The amazing sand dunes of Mui Ne, Vietnam. The Vietnamese classic breakfast noodle soup that could warm the coldest heart. These glorified subway sandwiches quickly become a staple in a backpacker’s diet. Roasted and peppered chicken or beef, pickled vegetables and thickly spread pâté in a crunchy baguette for under £1. How could one go wrong? Bahn Mi Sandwich – a backpacker’s staple in Vietnam. Sometimes branded as water spinach, this crisp Chinese vegetable is usually fried with garlic and always delicious. With a runny egg on top. Cheap, filling, great for hangovers. The Vietnamese get creative with their flavours. Spicy crab, crispy seaweed, English mature cheddar and pizza are just a few I spotted. You’ll be overjoyed to find high-quality Mexican and Indian food all over the place. If you’re in Hoi An or HCMC, please do yourself a favour and get a curry or four at Ganesh. This freshly brewed draught beer is outrageously, immorally cheap. We became regular customers of a woman in Hanoi who would sit us on plastic chairs on the pavement and pour us glass after glass for (wait for it) 5000 Vietnamese Dong each, which is less than 20p. You’ll want to stay forever. A Bia Hoi Junction in Hanoi, Vietnam – Where you can find the cheapest beer in Southeast Asia! Nicer hot than cold, super-strong. The preferred local poison. It goes down pretty smoothly, but be warned – it is lethal. A super-friendly hostel in Phong Nha with a buzzing atmosphere. The restaurant does good lasagne and bangers and mash if you need a Western food fix, and the outdoor pool is the perfect place to cool off after a hard day of trekking through caves or killing chickens (see above). The beds in the jungle-themed dorms are comfy too. This little hostel in Hoi An makes up for its slimy bathrooms and creaky beds with the most diverse buffet breakfast this side of India. From noodles to fresh watermelon and garlic bread to eggs made to order, it’s worth getting out of bed for. “Ninhvana” – The all-inclusive backpacker resort! Just right for the times when you’re tired of being an intrepid explorer and want to indulge for a couple of days. 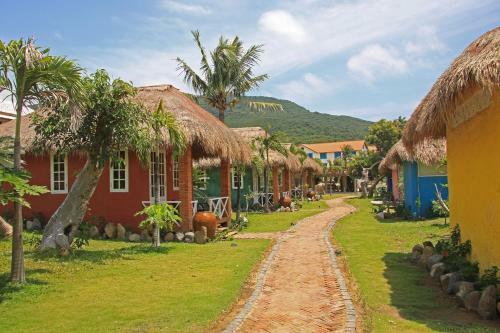 This newly opened ‘backpacker resort’ near Nha Trang is all-inclusive, so you never have to reach into your pocket – not for one of their huge homecooked dinners, kayak rent nor that seventh passionfruit mojito. There are two pools, courts for volleyball and basketball, big parties in the evenings and a spa. Great fun, but can leave one longing for a bit of grit. On the totally opposite side of the spectrum, this simple homestay was hands-down my favourite part of the trip. Located down a dirt track in the middle of a fruit farm, it is as close to an authentic Vietnamese experience as you can get: Giang and his family put you up in their traditional Vietnamese house, cook divine meals for you (which everyone eats together) and treat you like family. And family, of course, would never decline another shot of homemade rice wine, after shouting the local ‘cheers’. If you can’t get to this special place, stay at another of the dozens of homestays that are all over the country. Homestays are an unmissable opportunity to get to know somewhere more deeply, and with greater reward. This is essential for the frequent morning droplets and afternoon downpours in rainy season, especially if you plan to rent or buy motorbikes. In case of the latter, you’ll need a giant tarp for mud protection. And trainers. Motorbiking the Ha Giang Loop – Northern Vietnam. May seem a strange suggestion, but you haven’t truly experienced the country until you get a ‘Vietnamese kiss’: an exhaust burn from one of the inescapable motorbikes. These bandages (and staying out of water) are best for avoiding infection. Rejoice! Vietnam is one of the cheapest destinations in the world: dorm beds for £4 (GBP), long-distance night buses for £9 (GBP), street food for pennies. The low prices made me spend like a demon but I still stayed well below budget. North Face, Mont Blanc, Under Armour, Nike and New Balance rip-offs are everywhere and are mostly passable. The big cities have huge selections of beautiful, affordable shirts (and, of course, matching bucket hats). Look out for the ubiquitous fruit-themed ones. Hoi An’s famous tailor shops are the shortest route to feeling like a supermodel/movie star/crooner from the ’40s. I went to one with a badly-drawn design on a post-it note, and by the next day, I had a gorgeous maroon silk jumpsuit all for me! The gorgeous streets of Hoi An, Vietnam. See above. Warning: you’ll come to expect free beer, which can lead to disappointment in future travels. Hanoi and Saigon (Ho Chi Minh City) are the obvious culprits, but Hue, Danang and Nha Trang are also thronging centres of high energy and traffic in a country with 92 million people and 45 million motorbikes. Embrace them: they are invigorating and exciting. You’ll be blown away by what you see on a ten-minute journey from some activity to the hostel. Resplendent cliffs, impossibly green rice fields and majestic limestone karsts were the backdrop of an unforgettable month. Astounding Nature: Ban Gioc Waterfalls, Vietnam. Garlic frying, petrol, chicken broth. Most flights from the UK to Vietnam stop off in Bangkok, Singapore or Hong Kong, but direct ones from London To HCMC are available if you’re willing to pay more. The main international airports are HCMC, Hanoi and Danang (in that order). The more expensive alternative to buses, but many people do prefer train travel. There’s a pretty big community of backpackers buying and selling motorbikes in Hanoi and HCMC and then riding them to the other end of the country to be sold again. Main Facebook groups include Vietnam Backpacker Motorbike Market and Motorbikes For Sale Vietnam. Two backpackers motorbiking on the Buffalo Run with Vietnam Backpackers. This is an obvious option, and the bus from HCMC to Phnom Penh is cheap and fairly quick. Be sure to have all your visa stuff in order first! Best reached by air. Flights between HCMC and Bangkok are cheap and frequent. Hanoi and HCMC are major transport hubs in Asia, so whether the next destination on your bucket list is the palm-fringed beaches of Gili Air in Indonesia or a hectic food court in Singapore, you’ll be able to get there with little to no hassle! A month isn’t really enough to get under Vietnam’s skin – I packed it in but still didn’t manage much of the north. Six weeks would be the perfect (minimum) amount of time! The diversity of Vietnam is what makes it such a fascinating place to travel. Born and raised in Bristol, UK but of Italian-Irish-American and Sri Lankan descent, Cara has always had her eye on faraway lands! Right now she’s studying History and Spanish at University College London, but spent six months prior to that travelling through SE Asia on a shoestring. She’s also backpacked through Europe and has her sights set on Central America for her next trip! Are you interested in writing for us?